Listening to podcasts while commuting is a great way to learn new tips and skills to use on your blog and in marketing. Here are some recommendations for my favorite podcasts for bloggers. Sonia Simone is someone you should be listening to. She is an expert in content marketing and teaches actionable writing tips for content marketers. The free content included in these podcasts is amazing. I am also a member of Copyblogger’s paid membership called Authority and in my opinion the material on the podcasts is just as good as what I pay for (okay, maybe authority has a bit more). Copyblogger FM does not hold back on the podcast content though. I’m very excited that I learned recently that Sonia Simone has a podcast called Confessions of a Pink Haired Marketer. I cannot wait to dive into this one. As a blogger, you’ve likely heard of Darren Rowse. Problogger is his podcast. 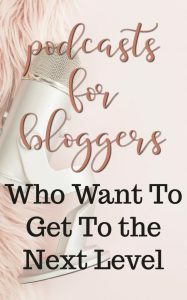 On this podcast you will learn many blogging tips and tricks including tips on writing, monetization, and promotion. If you get a chance, make sure you listen to an episode with his back story. It is great to see someone who is so successful who was just a “regular” person. He didn’t even know what a blog was when he started, but has gained MASSIVE success. His podcast is all about sharing his blogging knowledge so we can gain success too. There is a Facebook group related to this podcast that is also worth joining. Madalyn Sklar is an absolute expert in Twitter techniques. She has been using Twitter for a long time to engage with people and as a marketer. She has started a couple of highly successful Twitter chats and if you watch her on Twitter you will see she is often a guest on other Twitter chats. In this podcast, she teaches tips to use Twitter successfully in your business. Each week she interviews an influencer. A fun part of this podcast is she always asks them what tools they like to use with Twitter. If you like tools and software, you will love this because you will learn a ton of new cool tools out there and how people use them. Madalyn will keep you updated on what is working on Twitter and how to stay a real person that people connect with while on Twitter. Best of all, she is super approachable and nice when you talk to her on Twitter. Pat Flynn’s Smart Passive Income teaches you about the many ways people have made money online. He has interviewed several guests about what has been successful for them. He is open about his own journey in business. His website constantly shows his income reports and how much money his blog/podcast is making. He seems to be a nice, trustworthy guy. Seriously, listen to episode 273. Melissa Griffin’s Pursuit With Purpose is all about ensuring that you are pursuing a life of purpose while growing your business. This podcast is more inspirational than the others, but I would say this one also leaves you with some meaningful actions to take. This is one of my favorite podcasts. I hope you enjoy these recommendations and find some awesome content. Leave a comment letting me know what podcasts you recommend. Me too! I have found so many more since writing this and am always looking for new ones! Do you have any favorites? These are some great suggestions. Especially for newbie bloggers who are still working full time. As these will be perfect to listen to on a commute! Yes! I have some more to add. Food Blogger Pro, Do You Even Blog?